This diaper received rave reviews from the cloth diaper group so I decided to check it out. 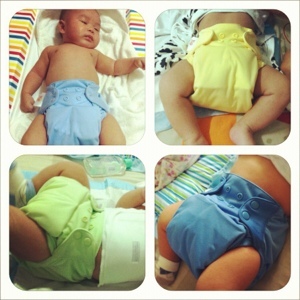 Flip diaper is a one size hybrid cloth diapering system so it has three different options for the insert; 1) stay dry insert in onesize and newborn size, 2) organic insert and 3) disposable insert for travelling and convenience purposes. The Flip cover is made from laminated polyester so we are able to re-use the cover 2-3 times and wipe the inside clean before placing a new insert. I only pre-washed the covers and inserts once and satisfied with the absorbency. You can read [here] for more information. My first impressions when I received these diapers was "wow this looks easy!" and I looove the colours! I currently have 6 covers - in twilight, grasshopper, butternut, moonbeam, ribbit and clementine and 15 stay dry inserts (left with 14 usable inserts) which can last for two days in between washing. 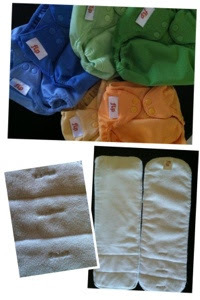 The insert is topped with suede layer for a stay dry effect on Baby's bum and 3 layers of very absorbent micro-terry on the bottom. The one size insert can be fold down - there is the stitched marks and labels - small, medium and large on the insert. I usually fold to small and place it in the front for more absorbency for my baby boy. It looks bunching up though but its okay. Flip is our workhorse daytime diaper - rotating between two covers and 4-6 inserts daily. One insert can last up to 3-4 hours unless when Baby Iq poops. We have been using the inserts for four months now, I have few that have visible stains, suede-topped started to pill slightly and has caused rashes to Baby Iq's bum. When we first started using Flip, I am very excited to see the magic of sun bleaching but lately it does not work so well anymore. I tried to put bleach in the washing (without soaking) and it does not seem to work either. I also tried using hot water, baking soda and vinegar and soaked overnight to treat the rashes it caused and it works! However the stain is still there so now I do not really care about the stain anymore. I love this cover's fit! I started using the cover when Baby was two months young (after we experienced leaks with his newborn cloth diapers). Baby Iq is currently on the smallest rise setting while on the waist, either two snaps visible when I changed Baby Iq or three set snaps (do we called it columns instead?) when my parents changed Baby Iq, both work fine for us with no leak so far! Excellent right? :D I love the stretchy tabs feature. This diaper looks very trim even under Baby's onesies, sleepsuits and going out pants. Definitely my favourite go-to daytime diaper! I bought a few at B$30 each with one insert, one was preloved at B$20 and a couple from Malaysia at RM69 each with lots of extra inserts. We invested about B$270 for all which means, since we have eliminated two packs of disposable diaper every month, we are breakeven at 7th month. I love this diaper mainly because I can change the inserts and reuse the covers. I switch between two covers daily - for the first cover I'd clean the inside and air dry it, then use the second cover for new diaper change and then, use again the first cover IF it is not dirtied with poop. So, I can have a blue day, green day or mustard day to ensure all of the covers are rotating evenly. I like the ease of using it and its convenience (even my parents know how to handle this! *big smiles*).